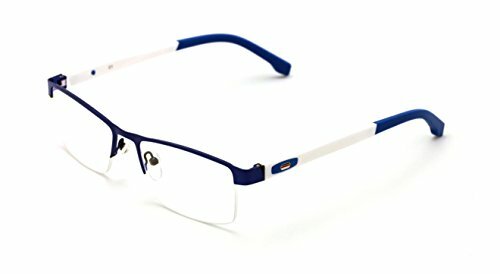 Quality durable eye glasses frame. Front is made out of metal, with metal spring hinges, temple is made out of hard composite. Adjustable English nose piece. Lightweight Design, Metal Spring Hinges, Stainless Steel Metal on the Front, TR90 Temple. Adult Size - 135mm frame width, 50mm lens width, 33mm lens height, 13mm bridge. Non-prescription frame with demo plastic lenses eyeglasses. Can be fitted by your doctor with your own prescription. Comes with an aluminum metal case. Adjustable English Nose Piece, Anti-Allergen Frame . If you have any questions about this product by V.W.E., contact us by completing and submitting the form below. If you are looking for a specif part number, please include it with your message.